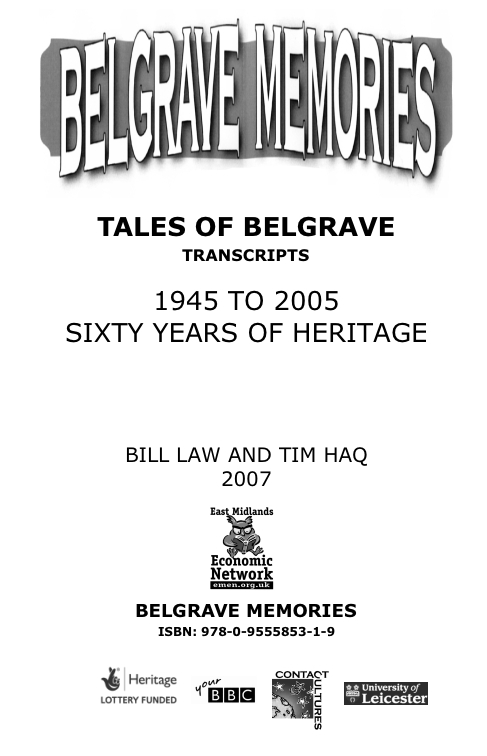 More than 80 people of all ages, gender, faith and ethnicity provide their insight into the changing face of Belgrave from the end of the Second World War in 1945 to the present day. This book published in Black & White provides 400 pages of the full transcripts of ALL those interviews. This oral history project would not have been possible without the support and assistance of many individuals and organisations, including Colin Hyde of East Midlands Oral History Archive, University of Leicester, Margaret Bonney of Leicester, Leicestershire & Rutlands Public Records Office, Contact Cultures for publishing the book on our behalf, and of course the people we interviewed.